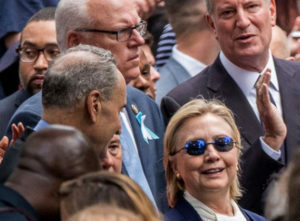 Hillary Clinton has a medical episode and leaves 9/11 Memorial Service early – possibly fainting as she’s loaded into a van by her security detail. But what’s even more interesting than that – Elton John first made an appearance surrounded by Hillary’s handlers! In this unique campaign appearance for the most unethical woman in history, Elton was seen with his signature ratty blond hair, chubby face and dark glasses grinning for the cameras. Notice in the video that Hillary is being propped against the piling by Huma and starts to collapse the moment she stops leaning on it.